The Word of God is sharper than any two-edged sword. It is so powerful! You can trust it because it is God speaking. The Word of God is the will of God, and the will of God is the Word of God! The first thing each and every Christian must fully realize is that the Holy Bible is truly the inspired and infallible Word of God. All of Scripture is given to us by inspiration from God the Father. “All Scripture is given by inspiration of God, and is profitable for doctrine, for reproof, for correction, for instruction in righteousness, that the man of God may be complete, thoroughly equipped for every good work.” (2 Timothy 3:16). We must speak the Word of God just as He did in the beginning, amen. This is not the last study, but it is one of the most valuable ones. The Word of God! 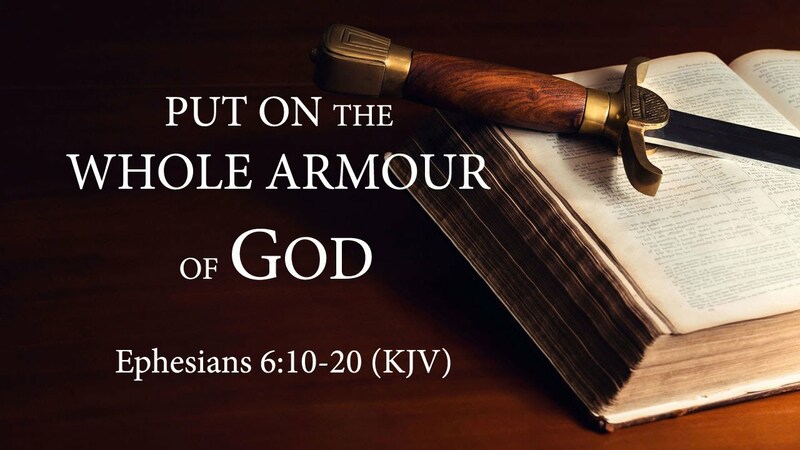 The Sword of the Spirit is unique because it is the only piece of armor that Paul actually describes in Ephesians 6. It is the only Offensive weapon! I listen to Priscilla Shirer’s study of this one closely, and got so much out of it: I will go back and do all the Actionable Intel as soon as I can; my time didn’t allow me to do that each week, but I will. Listen to her tape will help. Paul is telling us that to withstand the attacks from the enemy, we shouldn’t always take a defensive posture. Because the Sword Paul describes was so small, it was perfect for hand-to-hand combat. Sometimes it feels like the enemy is right in our face. Amen to that! This was so important to me, so I must share it. There are three different words in the original Scripture that translate Word of God; (1) GRAPHE, meaning the words on the page, the ink, the paper literally is the book itself. (2) LOGOS, the message of the graphe. (3) RHEMA, the Word of God is the utterance of God, the spoken Word of God to you in your life (Hebrews 4:12). This is a weapon for the evil day that comes upon us daily. We must push the enemy back with God’s Word. We must be active and proactive, amen. Use your dagger every day to defeat the enemy, to come against him. Each week’s strategy session is to be used. These strategies will help us stand firm and victorious in the fight against our enemy daily. We must pray without ceasing, (1 Thessalonians 5:17). That is our next and last lesson in this study. Glory to God!! !